Tug on the Stopper. If it doesn't come out, remove the pivot rod nut and pull out the pivot rod, then take out the stopper. Use pliers if needed. Bend a wire in a tight hook and fish out the hair. Run hot water through the drain to release any soapy scum and place the stopper back. If you had to remove the pivot rod, insert it the stopper back in place, then the pivot rod and pivot rod nut. 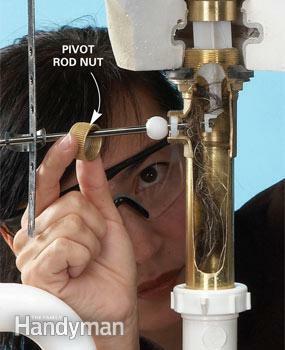 Screw the nut on and test the drain. Voila! In about 15 minutes your drain is working like new again.